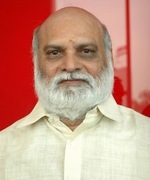 Raghavendra Rao most recent Sri Ramadasu was a major success, not only in India, but in the US and for the Telugus living abroad. instrumental in elevating many actors' career, image, and box-office potential. He also showed his prowess in Hindi by directing run-of-the mill storied movies like Himmatwala and Tofah. He also made feminine oriented films like Jyoti, Aame Katha and Kalpana and devotional films such as Annamayya, Sri Manjunatha, Sri Ramadasu and Pandurangadu. His film Pelli Sandadi has become one of the biggest musical hits of Telugu cinema. He also won the best choreographer Nandi Award for his dance direction in that film. Rao is responsible for boosting the careers of actresses such as Vijayashanti, Radha, Ramya Krishna, Raadhika Ramba, and Ravali. He is instrumental in giving a boost to many actors and actreses. He is also noted for his unique style of taking songs. He is the director who commercialised the Telugu cinema in a big way.